There are so many reasons to read Marion Nestle’s book, the Unsavory Truth, that it difficult to know where to begin. First of all, the author has the credentials that encourage readers to believe that what she is revealing is not fake news or propaganda. Nestle is the Paulette Goddard Professor of nutrition, food studies, and public health, emerita, at New York University, and Visiting Professor of nutritional sciences at Cornell University. She holds a PhD in molecular biology and an MPH in public health nutrition from UC Berkeley. Nestle vividly shares her discovery of the “truth.” She found that many food companies want us to believe their products are healthy (even nutritious). To reach this objective, they hire food experts (including academics and researchers), food writers/reporters, and others willing to shill their credentials for free travel, conference fees and/or dinner. What the food companies get in return is not science but opportunities to market their products based on biased (faulty?) research. 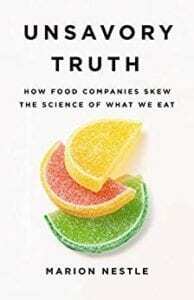 The “experts” skew the research to present information as expected by the food company that has hired them. Frequently the information reported is not only biased (in favor of the food company), but might actually be harmful as the stories tell us why bad food is actually good and recommended for breakfast, lunch and dinner. We all eat. Although we know that most processed food is not good for our gut, billions of dollars are spent every year on manufactured products that do nothing to keep us alive and well; in fact, they often lead to danger and even death. Poor food decisions can be attributed to more than 400,000 US deaths a year as these decisions lead to heart disease and related illnesses. An examination of data on US cardiovascular deaths in 2015, researchers determined that it was diet that contributed to the deaths of approximately 222,100 men and 193,400 women. Research indicates that eating large quantities of salty, fatty and sugar-filled “food” and limited amounts of fruit, vegetables and whole grains is not the path to a healthy lifestyle. According to Nestle, pharmaceutical companies motivate physicians to prescribe “…expensive and sometimes unnecessary brand-name drugs,” with incentives that include free trips to far-away places, complimentary dinners and other desired goodies. In 2010, Congress required drug companies to disclose payments to physicians. However, the food companies are not required to disclose their “incentives” when they engage nutrition professionals to “promote” their products. The researchers/writers are eager to get the goodies even if they deceive consumers – in order to stay on the “good side” of the food enterprises. In many instances, the people we want to believe have our best health interests at heart, have, in reality, their own best interests front and center. Research is expensive and funding from the government and foundations is scarce. So – in order to do the research (to advance an academic career), faculty frequently find themselves in a Catch 22 situation; take the money, do the research, get the promotion or… don’t take the money, forget about the research, and delete visions of academic advancement. Celebrities are purchased by food companies. The rich and famous encourage their fans to do what is best for them (i.e., megabucks for endorsements) and not what is best for their followers. In a 2016 study by Bragg, Miller, Elizee, Dighe & Elbel the research disclosed that music celebrities who are popular among adolescents endorse energy-dense, nutrient-poor products. Of the 590 endorsements made by the 163 celebrities in the sample, consumer goods (including fragrances, makeup) represented the largest endorsement category (25 percent), followed by food and beverage (18 percent) and retail (11 percent). Sixty-five celebrities were collectively associated with 57 different food and beverage brands owned by 38 parent companies. Of these 65 celebrities 53 (81.5percent) had approximately 1 Teen Choice Award nomination. Forty-nine (71 percent) of the 60 nonalcoholic beverage references promoted sugar-sweetened beverages. Twenty-one (80.8 percent) of the 26 endorsed foods were energy dense and nutrient poor. Baauer, will.i.am, Justin Timberlake, Maroon 5 and Britney Spears had the most food and beverage endorsements. In 2012, Beyoncé Knowles signed an endorsement deal with Pepsi worth an estimated $50 million and Justin Timberlake received an estimated $6 million for his involvement in the McDonald’s “I’m lovin’ it” tune. Beverage industry publications credit Latino rapper Pittbull’s endorsement of Dr Pepper with 4.6 million advertising impressions and increasing Dr Pepper sales among Latinos by 1.7 percent, despite the overall decline in carbonated soft drink sales. 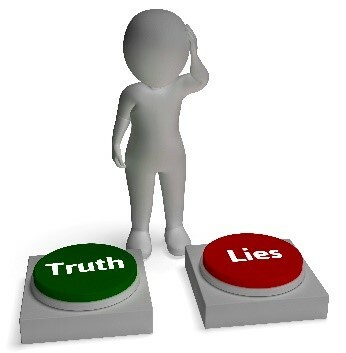 To prevent us from getting mired in the lies, fake news, tainted or slanted research, Nestle provides guidance that could help us determine the validity of the food industry proclamations and recommends reading the information published in academic journals that discloses financing, conflicts of interest and other self-serving engagements. Nestle tells us what to look for: If the study focuses on a single food (port, oats, pears), eating patterns (breakfast) or products (beef, diet sodas, chocolate) as improving our health, we should look for the funding source. While the advice is well-meaning, the reality is that most consumers do not have access to the academic journals that require authors to disclose funding sources. The data that enables Nestle to make an informed judgement call is not within the grasp of most consumers. Nestle also encourages all of us to hold the food companies accountable. Call the companies, tell them we want to know the names of the scientists, practitioners and societies they are funding the research and at what level. We want them to fund research, but for the “greater good of society” and without undue influence on the outcomes of the research. She recommends that we also hold our government agencies to a higher standard. The government should be funding basic research in general and nutrition, food and agriculture research specifically. Government leaders, “should not be allowing food companies to determine policies on nutrition and health. We can vote with our fork and we can vote with our “vote.” When we support elected officials, we should determine their position on food and nutrition along with their stance on other issues. Paul Brewbaker talks story with Hawaii Governor Ige. Tourism performance in Hawaii has been impaired by short-term exogenous factors which constrain tourism export receipts even when volumes are growing. Can the State afford more of the same for Hawaii Tourism?